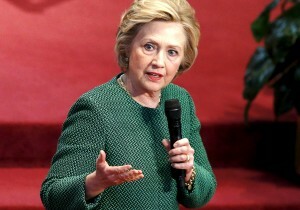 Democratic front-runner Hillary Clinton on Sunday dismissed the notion of a contested nominating convention and said she was not preparing for such a scenario, after her rival for her party’s presidential nomination racked up another victory. Bernie Sanders won the Wyoming caucuses on Saturday, his seventh victory over Clinton in the last eight Democratic nominating contests as the two gear up for a crucial matchup on April 19 in New York state. Sanders, a U.S. senator from Vermont, is trying to chip away at Clinton’s big lead in the number of delegates needed to secure the Democratic nomination for the Nov. 8 presidential election. He said on Sunday he believed he could close the gap, and left the door open for a so-called floor flight at the Democratic National Convention in Philadelphia in July if neither has won an outright majority of delegates. In that case, a system of multiple ballots takes place, governed by complex rules, with candidates hoping to persuade delegates to vote for them. The former U.S. secretary of state said she was leading Sanders by 2.5 million popular votes and in pledged delegates. “I feel good about the upcoming contests, and I expect to be the nominee,” she said. The specter of a contested convention, a relatively rare event in recent U.S. politics, looms much larger in the Republican race. While front-runner Donald Trump has amassed a delegate lead by winning many state contests, rival Ted Cruz has proved tenacious in pursuit of every last delegate available by other means. Cruz’s campaign has worked hard in states where the delegate allocation process is more complex, such as Colorado, where the U.S. senator from Texas garnered 34 delegates on Saturday. The Trump campaign has complained about the nominating process, including in Louisiana, where the New York billionaire Trump won the vote but split the delegates equally with Cruz. “Well, he’s threatening, you go to these county conventions, and you see the tactics, Gestapo tactics, the scorched-earth tactics,” Manafort said on NBC’s ‘Meet the Press’. 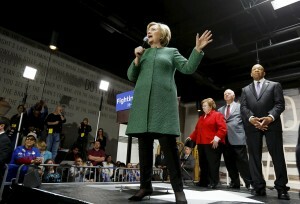 Clinton was campaigning in Baltimore on Sunday, where she received the endorsement of U.S. Representative Elijah Cummings ahead of Maryland’s nominating contest on April 25, where another 95 delegates are at stake. The Wyoming results did not change the delegate math for the Democratic contenders. Each won seven, since delegates are awarded proportionally based on caucus-goers’ support. But Sanders said future contests in the West and on the East Coast looked favorable to him, including New York, Pennsylvania, California and Oregon. Sanders sidestepped questions on whether he was prepared to take the nomination to a floor fight if Clinton did not win the magic number of pledged delegates, but he left the possibility open. An inquiry by the Federal Bureau of Investigation into Clinton’s use of a private email server in her Chappaqua, New York, home for her work as secretary of state continues to cast legal uncertainty over her campaign. On Sunday, her former boss, President Barack Obama, said he did not believe the arrangement harmed national security, despite more than 2,000 of her emails containing classified information, which the government bans from being handled outside secure, government-controlled channels. “There’s classified and then there’s classified,” Obama said in an interview with Fox News. He also emphasized that the U.S. Justice Department would investigate impartially, without heed to politics.